The Cornilléau Pro 510 Outdoor Stationary Table Tennis Table is undoubtedly an incredibly solid and well-built stationary table for heavy-duty. You can put the table at park or your backyard and playing the game with your family members, colleagues and friends. In case this is the first time you heard about this brand name, you may want to know more about what is this company about. 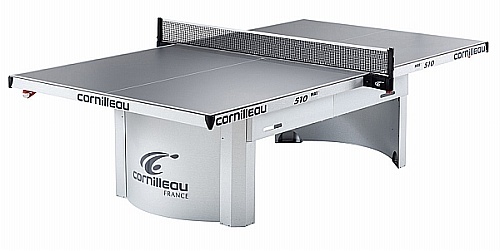 Cornilléau is actually one of the famous table tennis table manufacturers in the world. The company is based in France and it has designed, developed, and produced great quality of table tennis for over 40 years. The company is well-known for its state-of-the-art manufacturing approaches, superior quality materials, as well as comprehensive process of quality control to ensure all the tables that being produced are of top quality and customer satisfaction. The ping pong tables that manufactured by Cornilléau are with the use of galvanized steel along with other anti-corrosion materials to make the table sturdy enough to use for many years. One great thing that many people are choosing this company brand for the tables is due to Cornilleau offers an incredible 10-years warranty for Cornilleau Pro 510 Outdoor table tops, 3-years for indoor table tops and all table frames. You may need to spend some time to assemble and setup this outdoor ping pong table. The time that you need to take may be around 2 to 4 hours in order to have everything setting up. It is recommends that at least 2 people are assemble the table together, since this table is quite heavy and will need support of 2 people. If you happen to be a serious player or are intending to train yourself to become a professional player, then you should seriously think of buying this Cornilleau Pro 510 table tennis table. Most of the shops and outlets are selling this table for the price between $1400 – $1600. If you want to get a bargain, you may want to take a look at online site like Amazon. The table is solid enough for people to set it up at parks, camps or backyard. One of the desired features of the table is that it can be bolted down. In addition, the table is produced with galvanized steel, and the table top complies with ITTF bounce standards. Another great thing about this table is that the net is made of steel which made it very sturdy and can last for very long. If you buy this Cornilleau Pro 510, then you need to provide a good protection for the table since it is not cheap. 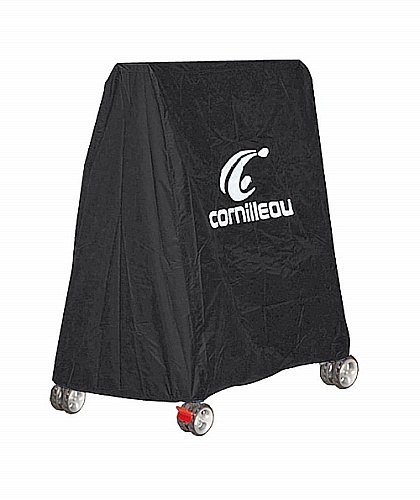 It is good for you to buy together a Cornilleau table tennis cover. You need to just spend extra of $90 – $120 and you will get a high quality cover to protect your investment. The cover is made of premium quality materials plus coated with polyethylene, which will provide a great protection of the table and prevent it to get damage. Besides, the advantages of using a cover can help to prevent dirt, rusting, as well as any kind of damage. Picking the Cornilleau Pro 510 outdoor table tennis and relevant equipment that meet your requirements can certainly help to ensure that you are going to enjoy the most beneficial playing experience and skill for you to become a professional player in a short period. Therefore, you need to make sure that you have study all other options prior for you to make your final decision in purchase the table. Thus, it still leave room of 21″ to 22″. You can pull in the chair if the height of your chair is not taller than that.